Denise Schmandt-Besserat is professor emerita of Art and Middle Eastern Studies at the University of Texas at Austin. Her field is the art and archaeology of the ancient Near East. She was trained at the Ecole du Louvre, Paris, France. Schmandt-Besserat has worked on the origin of writing and counting. Her publications on these subjects include: How Writing Came About , University of Texas Press 1996; Before Writing (2 vols), University of Texas Press 1992; The History of Counting , Morrow Jr. 1999 and numerous articles in major scholarly and popular journals (among which Science , Scientific American , Archaeology , American Journal of Archaeology , and Archaeology Odyssey ). Her work has been widely reported in the public media ( Scientific American , Time , Life , New York Times , The Washington Post , Los Angeles Times , Christian Science Monitor .) She was featured in several television programs such as Out of the Past (Discovery Channel), Discover (Disney Channel); The Nature of Things (CBC), Search for Solutions (PBS), and Tell the Truth (NBC). 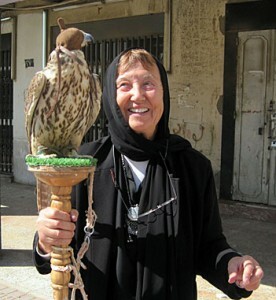 Professor Emerita Denise Schmandt-Besserat with a falcon in Ryadh, Saudi Arabia, 2011. In When Writing Met Art (2007), Denise Schmandt-Besserat investigated the impact of literacy on visual art. She showed that, before writing, art in the ancient Near East mostly consisted of repetitive motifs. But, after writing, conventions of the Mesopotamian script, such as the semantic use of form, size, order and placement of signs on a tablet was applied to images resulting in complex visual narratives. She also shows how, reciprocally, art played a crucial role in the evolution of writing from a mere accounting system to literature when funerary and votive inscriptions started to be featured on art monuments. Schmandt-Besserat’s present interest is the cognitive aspects of the token system that functioned as an extension of the human brain to collect, manipulate, store and retrieve data. She studies how processing an increasing volume of data over thousands of years brought people to think in greater abstraction. Denise Schmandt-Besserat edited and is the main contributor of Symbols at ‘Ain Ghazal , Vol. 3 of the ‘Ain Ghazal Excavation Reports, Ex Oriente, Berlin 2013. She authored 10 chapters of the volume, documenting and analyzing tokens, animal figurines, human figurines, a stone statuette, decorated human skulls, plaster statues, mural and floor paintings, and finally, a conclusion on neolithic symbolism. Denise Schmandt-Besserat has received a Dr. h. c., from Kenyon College, OH. ; the Walter J. Ong Award for Career Achievement; the Holloway teaching award; the Eugene Kayden Press Book Award and twice the Hamilton book Award. She has been cited Outstanding Woman in the Humanities by the American Association of University Women. Her book, How Writing Came About , was listed as one of the 100 books that shaped science in the 20th century. She is listed in Who’s Who in America and Wikipedia.